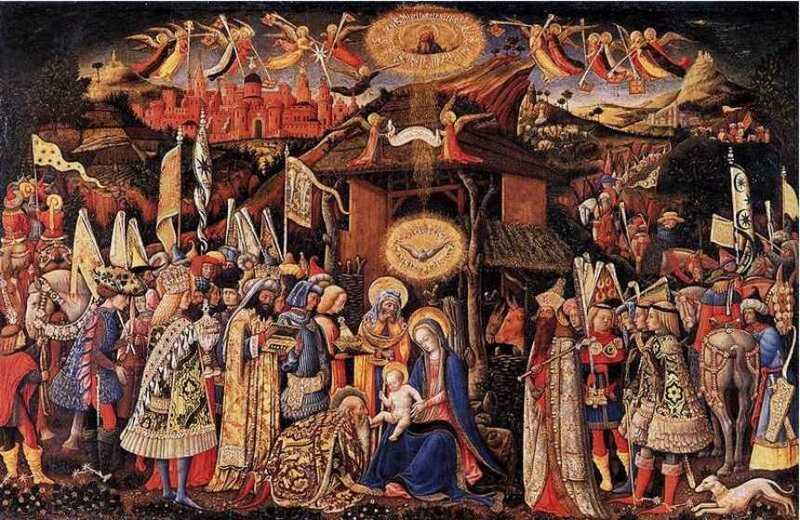 4pm Crib service - the Christmas story told simply as we make our crib and sing carols. 10am Communion service for all the family, with a story instead of a sermon. EVERYONE IS WELCOME AT EVERYTHING! Everyone is welcome at everything, no matter how young or old you are, no matter whether you are a regular or have never come to church before. No one will mind what you wear or whether you know what you are doing! No one will hassle you to join anything, commit yourself to anything or sign up to anything. Whoever you are, whatever your life story or background you are welcome here! The third of our Advent Breathing Space series is here. 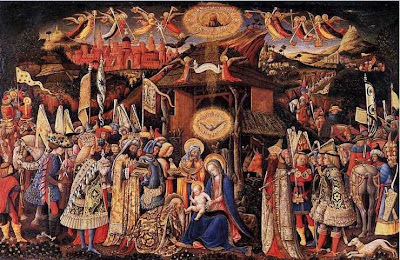 Tonight we were pondering the well-peopled nativity scenes (often of the Adoration of the Magi), like this one by Antonio Vivarini. USPG is an organisation which Seal Church has supported for many years (our special links are with Ruth and Saulo De Barros in Brazil, where Saulo is Bishop of the Diocese of the Amazon). This year it has changed its name. It now known simply as Us. The name may have changed, but the work is still the same, bringing hope and help to communities all round the world. Here is their latest video, about tea pickers in Sri Lanka. Why not sit down with a cup of tea (fairtrade I hope...?) and watch it. 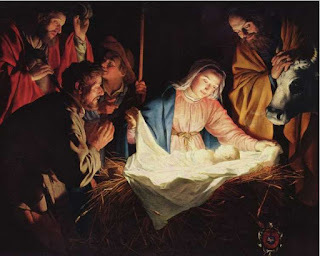 The second of our Advent Breathing Space Communion talks is here, on the theme of the "glow in the dark" baby, like this one, painted by Gerard Van Honthorst. You may have read in previous posts of the situation the Anglican Church of Zimbabwe has been in for several years now. Throughout the country clergy and congregations have been unable to worship in their churches, which had been taken over by rival clergy and bishops sympathetic to Robert Mugabe. A court case finally restored the churches to their rightful congregations and on Sunday Harare Cathedral is to be re-hallowed as part of this. Bishop Brian, the Bishop of Tonbridge, is to be there to represent Rochester Diocese as we are twinned with the Diocese of Harare. A letter from Bishop James can be found here, and a prayer for the people of Zimbabwe written for this occasion is below. and pray with them this day as they celebrate the re-hallowing of their Cathedral. help them and us to serve you with joy. Rochester Cathedral have asked us to give a plug to their annual Christmas Concert next Tuesday at 7.30pm. Happy to do so - it will be a splendid evening I am sure! They will be singing Handel's Messiah (Part 1) and other Christmas music as well as some carols for the audience to join in with as well. Tickets are £12 or £8 (concessions) on the door. The first of our Advent Breathing Space candlelit Communion services took place yesterday evening. 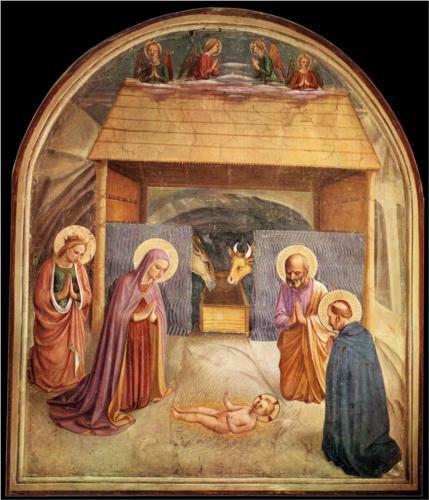 In these three services I will be reflrecting on three different classic portrayals of the nativity story in art. 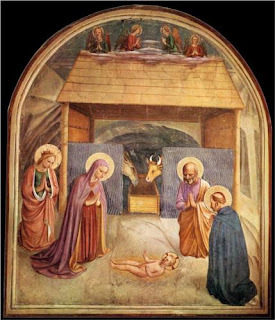 The first service looked at the image of Jesus as a newborn lying naked on the ground (see the example right by Fra Angelico) while Mary and Joseph kneel in prayer, an image that can seem rather odd to us - who'd leave a baby lying about like that, cold and uncomfortable...?